Originally constructed in 1905, Mt. Olive Cathedral in Memphis Tennessee just underwent its second renovation. When church leadership set out to modernize the facility, they wanted to blend the old with the new keeping the charm of the original space. 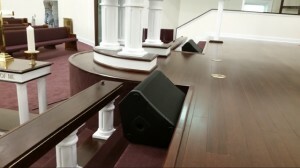 Mount Olive chose Dill Audio of Jackson, TN to do the install and Tim Dill himself was the design lead on this project. He decided to stick with an all QSC speaker, amp and processing solution. 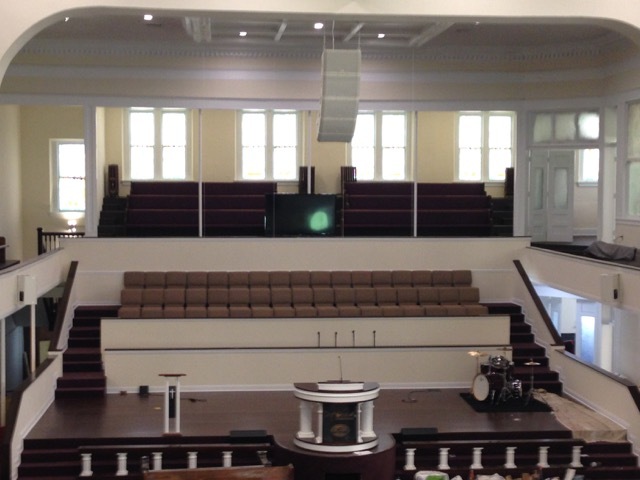 For the main PA, Tim selected a 5-box QSC KLA Line Array system supplemented by a KW181 subwoofer. 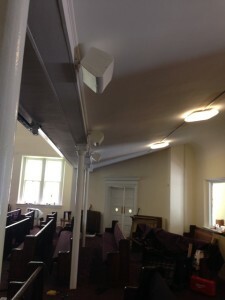 The folks on stage are hearing themselves via a pair of AP-5122m monitors at the stage lip while the choir gets their feed from a pair of AP-5102s mounted to the wall at either side of the stage. The AP Series can provide high fidelity, dynamic sound at high output. The under-balcony and narthex areas are also covered by QSC, using the Acoustic Design Surface Mount Series. The AD-S6T offered a very clean looking solution that sounded great and was easy to install using the X-Mount mounting system. Perhaps the most impressive thing about this whole system is that every speaker in the facility, except for the KLA Arrays and sub, is being run by a single amplifier. Tim chose the CXD4.5 to drive the monitors, under-balcony and narthex speakers. The built in DSP offered Dill Audio the ability to quickly set up speaker voicings, limiting and protection using QSC’s intrinsic correction filters. This is a beautiful example of what is possible with the complete QSC solution. The system looks fantastic, sounds great and has a minimal visual impact. The entire audio system only has 6 different products in it!